My wedding anniversary is in January, and last year my anniversary present to my wife was taking a nice trip and going completely offline for a week. This year I’m repeating my attempt to go offline, so don’t expect any posts from me this coming week. Wish you and Mrs Cutts a great 2008 and a happy wedding anniversary. Better by what standard? Do they mean the Judea-Christian standards of morality? Or are their focus on scientific long term planet survival? The goals of that question is honorable, but it is not realistic. Individuals make up companies and countries;; it is not like their separate autonomous entities on to themselves. If answers were that easy and individuals were that worldly and perspective to answer them, the problems would have been resolved a long time ago because it would have been in everyones conscientious self interest to do it. The obvious, cliche’ answers are going to be: environmental awareness, world peace, world literacy, population control etc. Those same answers would have been given in 2000, 1990, 1980 etc. But come this time 2008, 2009, 2010, 2020… the world will be doing the very same things it is currently doing today, because you can’t change human nature in a matter of decades or even centuries. The goals of that question are honorable, but it is not realistic. Individuals make up companies and countries; it is not like they are separate autonomous entities on to themselves. Well, if this weren’t a family site I’d say that they should chill the F**K out. But I won’t, so I’d say that perhaps people should just relax a bit about the stuff they can’t actually control and focus on one or two things they can affect. For example, the UN (to pick an example) seems to spend a lot of time condemning Israel for, well, everything. Nothing the UN can do about Israel. Perhaps they should spend 100% of their time scraping up troops to send to Darfur. Or maybe they pay attention to their rebuild and not screw that up. Another example: Europe spends a lot of their energy carping about carbon emissions, specifically in regard to the US. Meanwhile their emissions not only rise but at a higher rate than ours. Clearly they can’t do spit about it, at least not right now. Perhaps they should take a look at their research institutions and work on making them better so that they stay competitive in the long term. Or convince the French to do something about that cars turning right have right-of-way thing. Personally, this is one of my guiding rules: concentrate on things you can actually do, and only do a few at a time. So, I’m not trying to be the perfect dad, but I do try to get more sleep (=more patience) and play at least one game/day/child, even if it is just a silly word game. May 2008 bring you lots of happyness: a healthy family, love, money and respect. Matt, that is a very nice picture. I saw something a few blocks from my house that could easily top that though (which says something, considering how hard it would be to do so otherwise), but too bad the house is in a gang-infested neighborhood, otherwise I would take a picture of it and show you. Speaking as someone who goes just a wheee bit overboard in holiday decorating (this year was 17,000 lights plus giant inflatable Elmo, Frosty, Santa, Spongebob, and Homer Simpson – D’OH! ), that picture of the Omaha Christmas Lights was awesome!!! That is my wife’s ex-husband’s house. Well technically his mom’s house as his was the one on the other side of the empty lot. What do we need to do in 2008 to make the world a better place? This isn’t that hard, or that deep. We need to learn to respect each other. That’s all. Of course, knowing countries, companies and individuals as we do, asking everyone to respect the beliefs and wishes of everyone else is a tad outside the realm of reality. Hey, you asked what we needed to do, not what we could realistically make happen. I would like to see people be less angry! And realize that one person can make a positive and lasting impact. You just need to choose your cause and with a little focus, motivation, and persistence you can do GREAT things! All I know about the Davos is the snowboarding is bloody fantastic =D and the ‘town’ isnt have bad either!! Wow, not many people in my home town decorate like that. Though on Holloween, it’s a different story. A lot of issues and problems can be resolved if entities and people would just…”LISTEN!” to each other. We HEAR things, but a lot of the time we do not LISTEN. When entities & people do not LISTEN to each other, there is frustration, retaliation, and ignorance. Spend time to really LISTEN to others and the communication and understanding will improve the world we share. Happy wedding anniversary and holidays matt. Answer to the Davos question: Every inividual must go offline for atleast a week in 2008. Reduced electricity usage = Better planet Earth. More time with family = Better Personal life. Less time with computers = Less bugs in Software. Have a great 2008 Matt and thanks for knowledge sharing. BTW, ironic how nobody could careless about the “greenhouse effect” at Xmas time, yet point the finger of blame in every direction but at themselves the other 364 days of the Year. Wish you all happy and prosperous New Year! That’s a good gift idea 🙂 I am sure my wife would be happy if I get off the computer for more than a day. Happy new year Matt and all readers around here. Wow, that pic reminds me of that guy who spends $5,000 on his electricity bill for Dec. Went all out! You know that we are all imperfect so, how about we (individuals) focus on the good in the people around us and learn to be more forgiving of those impefections as they arise during the year. Most of us work for a company, and live in a country. Our individual actions influence the folks around us, and that influence finds its way into the companies we work for and countries where we live. Wow, I like the puppets.Wish you gud luck and happy always for 2008. We have some friends that do that same type of over the top Christmas display. Seems to be way too much work for me. I won’t even get on the second story roof of our house to run lights along the edge as my wife would like. Not that I am afraid of heights, I just figure if I fell it would be all over and dying to hang a string of colored lights would not be a good way to go. I will think about that Davos question….. Mind their own business. Let countries decide on their own borders. I believe the one major thing countries can do to make the world a better place is to keep their word after they signed the agreement at the 2002 Monterrey Conference and again at the 2002 Johannesburg Summit to contribute at least 0.7% of their national income in aid to poor countries. Matt, what does Google, Inc. do in the way of charity? I am sure Google helps out a lot, but I haven’t really researched it to really know all of the ways they help. Hey Matt, I’m just curious…about what percentage of houses and/or businesses bothered with exterior decoration at all in Omaha (not necessarily to that extent, even…just in general)? Almost no one (I’d say maybe 20%) did here. As far as the answer to the question goes, I’ve never heard it put that way before, but to me it’s a bit of a no-brainer: reintroduce the California mandate of 1990 that stated that at least 10% of vehicles sold in the state had to be ZEVs (Zero Emission Vehicles) by 2003 (not so coincidentally, the year in which the law was repealed), and bring it to all countries. Too many of the problems in this world happen because people make decisions solely based on themselves. If we’d all take a second to think if what we are doing is going to be affecting others negatively, the world might be a better place. what should people and countries do this year? Treat other people/countries in the way that they would like to be treated themselves of course. Elephants carry the seed of certain of the acacia species and in order for the dessert regions across northern africa arabia asia etc to be checked so that they do not continue to grow the acacia species is the one that needs to be plantd on the edges of these dessert regions first so that other plants and then forestation can take hold. The natural way the acacia seeds are planted and nourished is via the elephant which provides the organic manure required to nourish the acacia seeds enabling them to grow. Since deforestation and growth of dessert regions is a major factor when it comes to global warming and the planets future it might be a goog 🙂 idea to make people aware of this information and perhaps consider using it to help reforest the edges of desert regions using elephants as the long term solution and vessel that would make this naturally work. The acacia needs to be planted and take hold first to naturally check the growth of certain desert regions and the elephant carries said seeds and provides the food these seeds need to grow. To me knowing this the answer to “How to redress the growth of Deserts” is obvious and staring us straight in the face. Countries should think about it how easy and quick war is made. because this is much more complicated. Companies should think about, that no one can make a circle more roundly. Peoples should less vain and envious and have more endurance. Don’t tell Al Gore about that house. 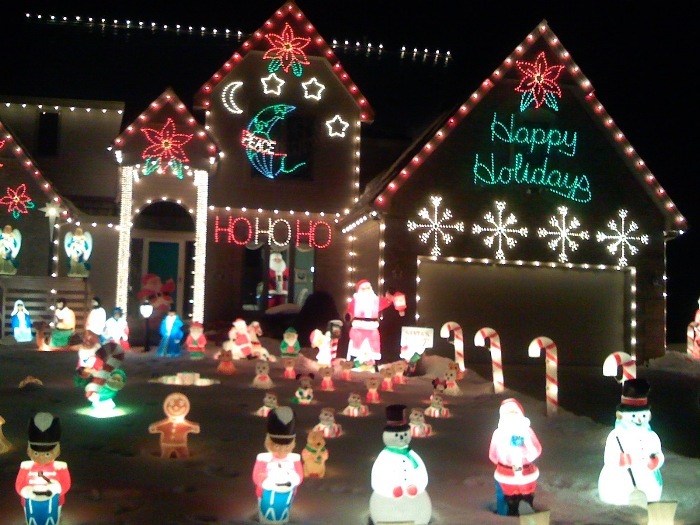 I wonder what their electric bill will be for December. Wow, that house is awesome. I don’t think I’ve seen one that elaborate. Push to impeach Bush and Chaney! Communicate in a clear and forthcoming manner. There is something incredibly scary about that photo… it reminds me of some of the halloween landscapes that people setup. There is one similar in my neighborhood. They have literally filled the yard with inflatable christmas paraphernalia… you can no longer see the grass. “I’m dreaming of a plastic christmas….” Just doesn’t have the same ring. We all need to worry less about being PC and more about Wisdom. To actively encourage self development of each member of staff. Everyone has something unique that they can bring to an organisation. Make a promise to yourself to learn something new everyday and to make at least one person laugh. Think to the future but don’t forget the past. I think individuals, companies and countries should strive to be more Chinese – Work Harder. Be considerate. So much can be resolved through civility alone. The one thing Google can do is let pages in the Supplemental Results Index rank on the basis of RELEVANCE so that less relevant content in the Main Web Index is not shown first. I’d LOVE to see that change implemented by end of 1st Quarter 2008. Shall we agree to that deadline? If any of these entities would look beyond themselves and ask, “Would mankind be better off without me or am I helping my common man?”. So often we look at ourselves and forget everything going on in the world. We believe the only things that are important are the things that relate to us. On a personal note, I think if families adodpted children from different cultures it would open their eyes. My wife and I are. I love that house you took a photo on Omaha. It’s a wonderful Christmas theme. I wish my house was decorated like that this Christmas. Countries should invade each other a little less. teach countries that like to pollute our plant not to. Yes that means you US and your buddies Canada, Japan, China and Russia. Become healthy is the only thing that helps countries, companies or individuals to make it better place. Because, becoming unhealthy is a crime. Well Matt have a nice holidays. nice holiday Matt! waiting for come online and next precious post. I tried going off line for a week. I failed! Just like a crack addict, I roamed the city looking for libraries, coffee shops or even a Bust Buy or Circuit City where I could jump online for a few minutes and check my email. Happy Anniversary Matt. Enjoy the week off and Happy New Year. Cool house! We have a few homes in the Pasadena area that go all out. I’ll be going to Omaha later this year. Never been. Any tips? Regarding Davos question. All countries need to be less dependent on oil! Solar and alternative fuel sources are a must! Aww, your wife’s family lives in Omaha?! I wish I knew that, I would have liked to meet you over the holidays. Just to say I did. Next time you’re out here let a brother know! Impressing Christmas House. Where can I find it? I did the same over the Xmas period, and it has done me the world of good to get away from the computer – hopefully I will get the same opportunity to have a break during this year, I would make it a new years resolution but I would only break it if I did! Everybody is talking about the Davos Question http://googleblog.blogspot.com/2007/12/davos-question.html. So HEY GOOGLE, where are the results? Lots of people voted – and since it’s over now – you can release the voting results now.